Cue the entire Beyonce album and start the chorus of “I ain’t sorry”, “Freedom” and “Better call Becky with the good hair”! This outfit reminded me of a Bey swag (for obvious reasons) that was full of unapologetic boldness, girl power and fierceness. I love a good print but I typically stick to traditional style prints (houndstooth, grid, animal, polka dots, etc.). When I saw this skirt however, I was both intrigued and nervous to try it. I thought to myself, “Is this print too loud for my body type?” and “Will it garner too much attention?”. But then I came to my senses and decided to take a risk and try it. And let me tell you, I am so happy that I did. Wearing a fruit print is a first for me but I absolutely love it. It’s fun, unexpected and perfect for the Summer. Every now and then you have to step out of your comfort zone and think “WWBD”…what would Beyonce do? And you know what she would do? She would take the risk and turn lemons into lemonade. Thank you! I actually recently did a post on my favorite shapewear found here. Excited to meet you as well! Just to say: yes , yes! and Yes!!!!! That’s a nice skirt. llo,ciao…You’re so right! Your words are very nice…Try, try, try and take the risk always and the Life is so Beautiful!…this outfit isperfect to celebrate Your stunning Beauty…Your amazing Silhouette is shinning like the Sun…cheers! AMAZING as always, executed so gracefully! Love Love Love!! I saw the pink dress on another blog but I’m pretty sure I love this more! Love this look on you! The length of that skirt is perfection! Loving the Lemonade you’re serving! ? I Love Love Love this outfit! I would totaly do a copy/paste if I could purchase the items in Sweden. 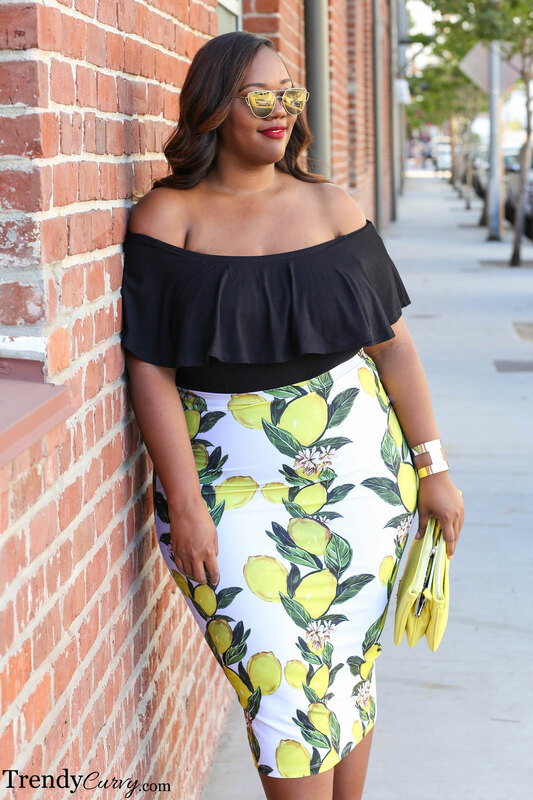 You look amazing in everything and this lemon skirt is DARLING!! !